SAN NARCISO, Calif. (Bennington Vale Evening Transcript) -- According to the latest Farmers’ Almanac, which called its annual forecast “clime and punishment,” the frigid, bitterly cold, snow-laden winter that blighted 2014 will continue into the new year with below-normal temperatures for 75 percent of the nation. In some regions of the country, arctic air could plunge the thermometer down to 40 degrees below zero. No region, the Almanac warned, will experience “prolonged spells of above-normal temperatures.” For the myriad citizens likely to be impacted by these adverse weather conditions, a great deal of hope was placed on promises of an early spring yesterday morning from Punxsutawney Phil, the groundhog who emerges from his den each February 2 to predict the length of winter. 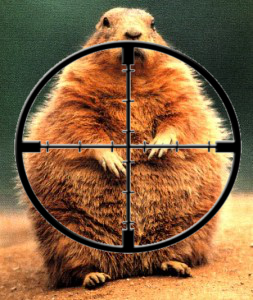 But as 12,000 freezing people gathered before dawn in western Pennsylvania, the world's most malignant marmot saw his shadow and delivered the bad news that winter will last another six weeks. Riots immediately ensued, followed by a gruesome spectacle of revenge reminiscent of an ISIS beheading. The annual event, normally an excuse for revelry and paying homage to the kitschy traditions of the region's European settlers, turned ugly immediately after the rodent's prediction. Millions of Americans this year are without work or the income necessary to provide for adequate heat, shelter and provisions during what promises to be a harsh winter. As the flowing tears turned quickly to fear and anger, mobs of disadvantaged Americans charged the groundhog and tore him apart. Some pulled scraps from the carcass to use for food. Others wrote obscenities on nearby buildings using the animal's blood. And one couple pushed the groundhog's decapitated head onto a wooden spike to parade it about the crowd in effigy. Beleaguered organizers admitted that outbreaks of violence and animal cruelty have become increasingly more common in recent Groundhog’s Day observances. “Imagine what would have happened if he’d predicted another recession,” one of the groundhog’s handlers said. In related news, Newt Gingrich, former presidential candidate and current Chris Christie campaign advisor, stopped urging the New Jersey governor to push for the development of a massive bridge to the moon so he could introduce an even more bizarre campaign stunt -- using a newt (the amphibian related to salamanders) to predict the GOP’s chances for taking over the White House in 2016. “If the newt ventures out to eat where it defecated, then Christie will become our next president,” a Gingrich aide explained. "If not, get ready for four years of a bitchy, smug, skirt-chasing Clinton. We are, of course, referring to Hillary." Gov. Christie, who injured himself when the folding director’s chair he’d been given by event organizers shattered, sending him toppling to the frozen pavement below, couldn’t be reached for comment.